Friday again already, this is the weekend that we will sort the carpet out and the shower enclosure. Have to get them organised. 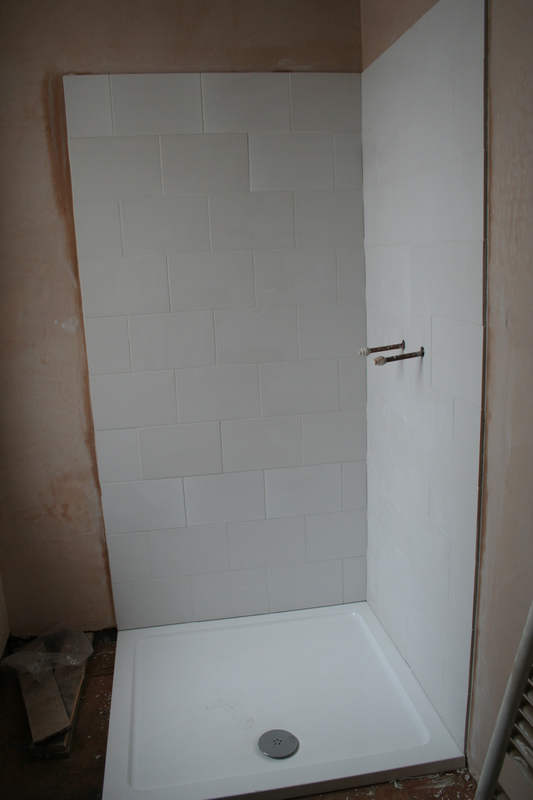 The tiles are in ready for the shower and the enclosure, had to go for the brick effect again despite trying really hard to go for a different look. They are big this time at least. 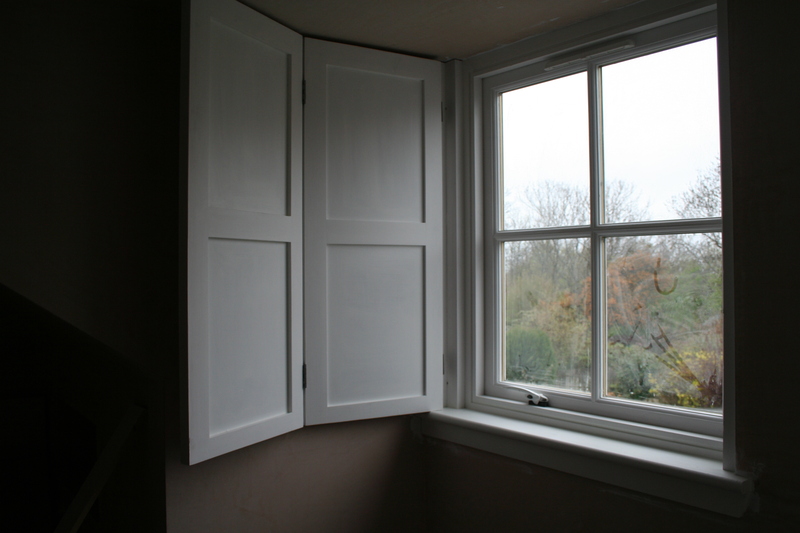 The painter has been busy upstairs again today, he’s started on the shutters, my essential extra in the back bedroom. The rhs one is not balanced yet but the man who can sort it out is coming tomorrow thankfully. I have always wanted shutters, I just love them. My paternal grandparents had them in their Leopold Place flat and I spent hours opening and shutting them in the living room that nobody went into, unless it was a special occasion, of course. The room also held my Grandpa’s piano. He used to play the Sugar Plum Fairy for my sister and me to dance to. This actually meant jumping from one big blob on the carpet to another. The carpet was red and the blobs were very elaborate and colourful. There’s probably a name for the particular type of carpet – I’m sure it will be retro-cool again soon though it’s not the look we’re going for on the stairs this time. The last image for today is the Hornsea Tapestry items that I promised you from the flea market last Saturday. The cruet set is going to be a fixture on the dining table. I need to get the pepper pot some white ground pepper which I’m sure is what would suit it best. I am so pleased with these pots it’s daft, I’m not sure where they will end up so they are gracing the window sill in the ‘big room’ at the moment. 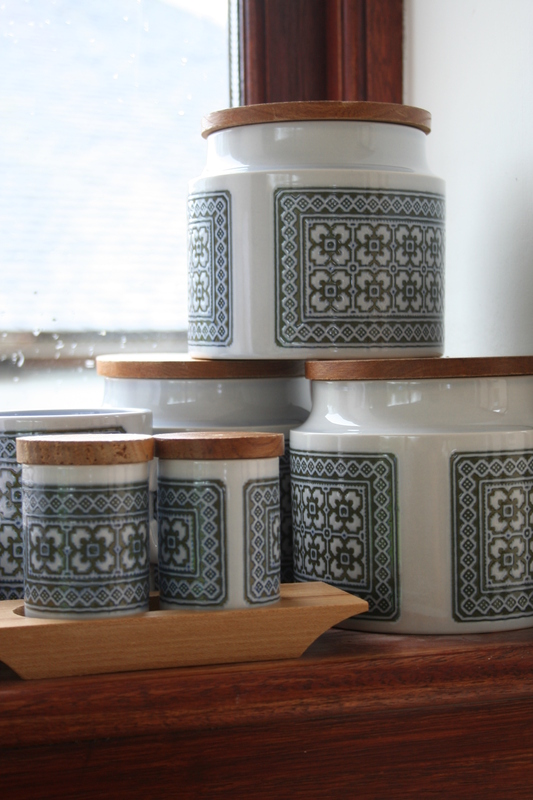 Hornsea from the flea market last weekend. Oh my word as I sit and type there is sleet battering the big windows, isn’t it May??? Brrr looks miserable, it started just as C was going to take the dogs out for a walk, he’s now watching Question of Sport until it clears. It keeps coming in waves, dogs still up for their walk though!